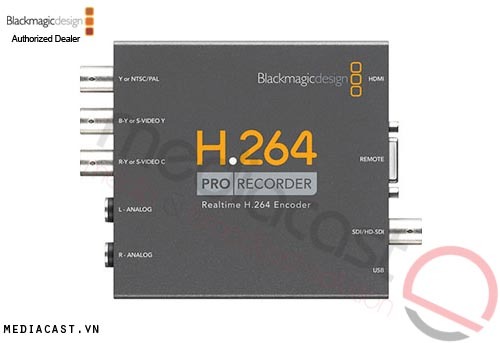 H264 H.264 Pro Recorder là Bộ mã hóa tín hiệu video SDI/HDMI/Composite sang định dạng web H.264 trong thời gian thực. Connections SDI Video Input: 1 x 12 bit SD/HD switchable. Analog Audio Input: 2 Channels of professional balanced analog audio with standard 1/4-inch jack connections. Standards HD Format Support: 720p50, 720p59.94, 720p60, 1080PsF23.98, 1080p23.98, 1080PsF24, 1080p24, 1080PsF25, 1080p25, 1080PsF29.97, 1080p29.97, 1080PsF30, 1080p30, 1080i50, 1080p50, 1080i59.94, 1080p59.94, 1080i60, and 1080p60. Processing Encoding: Hardware based real time H.264 encoder supports multiple profiles for small, portable video devices through to full resolution HDTV. Firmware Firmware upgrade via USB. Installation Connect unit to the computer's USB 2.0 port, install Blackmagic H.264 Pro Recorder software and run Media Express.